Asia is seeing high consolidation of land and land reform is moving in the opposite direction, says a report by Spain-based non-profit GRAIN. Only 6 per cent of farm owners control two-thirds of the continent’s agricultural land. These land owners are politically connected elites, as is the case in the Philippines, Cambodia, Malaysia, Pakistan, and Indonesia. GRAIN works to support small farmers and social movements in their struggle for community-controlled and biodiversity-based food systems. The report, released today, claims that changes in legislations in Asian countries support corporate land-grabbing, displace millions of farmers, undermine local food systems and, consequently, lead to violent conflicts. By GRAIN's calculations, the legislative changes have already led to the transfer of at least 43.5 million hectares of farmland in Asia from small farmers to agribusiness companies. The report analyses how traditional support systems of peasants and small farmers are now systematically being taken away by governments for large-scale corporate farming, dams, and other infrastructure projects. It adds that the number of small farmers in Indonesia fell by 16 per cent between 2003 and 2013, while the number of large-scale farms increased by 54 per cent and the number of plantations increased by 19 per cent over the same period. Most of Indonesia's farmers, around 55 per cent, now farm on less than half a hectare. The report alleges that inter-government organisations and UN agencies like International Fund for Agricultural Development (IFAD) and Food and Agriculture Organization (FAO), World Bank, and Asian Development Bank are also encouraging corporate and contract farming. These organisations provide key technical, financial and policy support to implement legislative changes, it says. In 2012, Burma enacted the Vacant, Fallow and Virgin Lands Management Law—called “the land-grabbing law” by farmers—which aims to make lands the government identifies as “vacant” or “uncultivated” available as concessions of up to 20,000 ha for companies. In 2001, Cambodia passed a Land Law and an Economic Land Concession (ELCs) law that enables private companies to own concessions of 10,000 ha of land for up to 99 years. This has enabled the transfer of 70 per cent of the country’s arable land, equal to 2.1 million ha, to industrial agriculture firms and forced hundreds of thousands of farmers off their lands. In 2013, India enacted the Right to Fair Compensation and Transparency in Land Acquisition, Rehabilitation and Resettlement Act, 2013, replacing the colonial land acquisition law of 1894. But the new government brought an ordinance in 2014 to change the Act by removing the consensus and social impact assessment clauses. In 2010, Indonesia introduced a new mega project called the Merauke Integrated Food and Energy Estate (MIFEE), covering 2.5 million ha of land belonging to the Malind community of Papua. A 2014 national human rights commission (Komnas HAM) inquiry found that the project has led to increasing rights violations and intimidation of villagers and loss of livelihoods. In 2009, the Japanese government revised the Agricultural Land Law, abandoning the owner-cultivator principle and promoting the “efficient” use of farmland to maintain rights to land. It also opened up the leasing of farmland to all forms of corporations with almost no restrictions. Pakistan's farmland was recently opened up to foreign investors and large-scale farm concessions through the Corporate Farming Ordinance of 2004, followed by the 2009 Foreign Agriculture Law. These measures allow for 100 per cent foreign equity in farming companies and offer generous financial incentives, such as exemptions on land transfer duties and the waiver of customs duties and sales taxes on agricultural machinery imports. In the Philippines in recent years, commercial farming developed further through the creation of agribusiness parks. In 2012, the government enacted a new policy that designated strategic agriculture and fisheries development zones. In Taiwan, the 2008 Land Expropriation Act allowed the government to take over agricultural land to lease or sell to developers of industrial complexes, food processing industries and facilities for the export market. Farmers across the country have staged numerous protests. The protests lasted three years until the regional planning committee was finally forced to overrule the project in 2011. 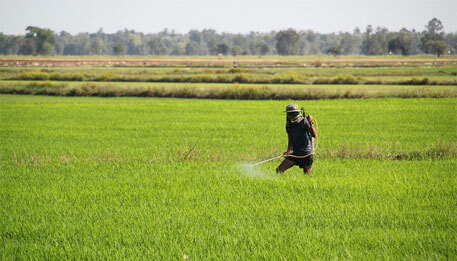 There have been no changes to Thailand's agrarian law in the past 40 years. However, the Forestry Master Plan (FMP) issued by Thailand’s Internal Security Operations Command and the Ministry of Natural Resources and Environment in 2014 opened the door to large concessions in forest areas to be allocated to companies, putting small scale farmers who live and farm within these areas at risk of forced relocation. Its in reverse because the reality is this unverified socialist/communist experiment will destroy a country's economy especially its agricultural sector and along with it its farmers. You cannot force a farmer who only has four to five years of education, has no capital & resources, doesnt know anything about management, has no entrepreneurial skills, etc to make his land productive. Its the height of naivete to think so. Distributing land to people who will will be burdened by it and the populace that depends on it is idiotic. But such is the thinking of some. They want to distribute poverty.